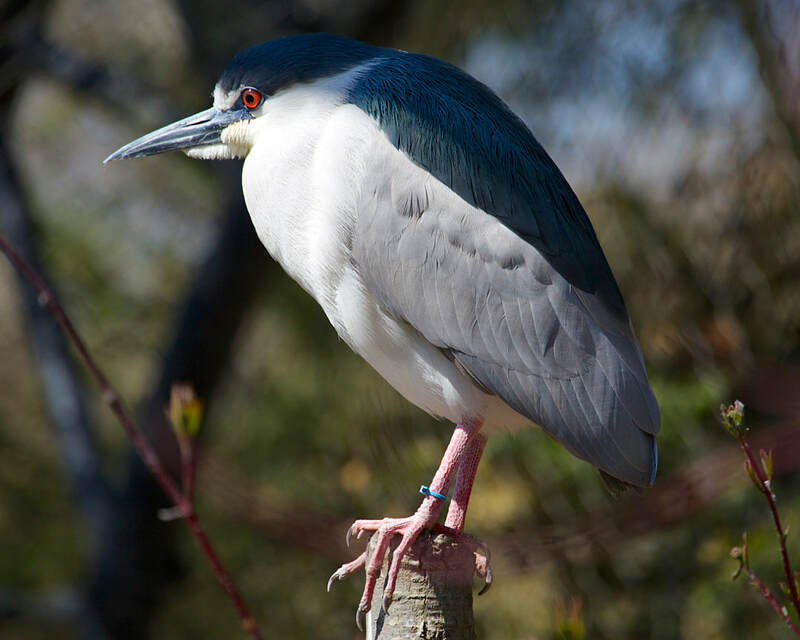 Black-crowned night-herons do not fit the typical body form of the heron family. Their resting posture is rather hunched, and they have shorter bills, legs and necks than other types of herons. When they hunt they extend their necks and look more like other wading birds. Adult birds have black caps and backs, pale gray wings, white underparts, red eyes and yellow legs. Two or three long white plumes extend from the back of the head and are evident during courtship. They have black bills and pinkish or yellowish legs. Males are slightly larger. Immature birds have dull gray-brown plumage on their heads, wings and backs with many pale spots. Their underparts are paler and streaked with brown. They have orange eyes and dull greenish yellow legs. They are found in various wetland habitats, including salt, brackish and freshwater marshes, swamps, streams, lakes and fields. 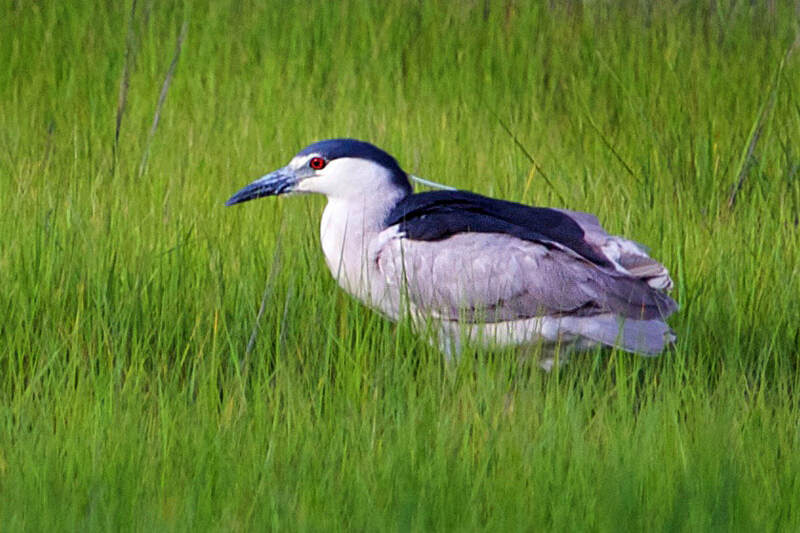 The black-crowned night-heron breeds on every continent except Australia and Antarctica. They are one of the most common herons in the northern United States, breeding everywhere except the southwest and Rocky Mountain states. 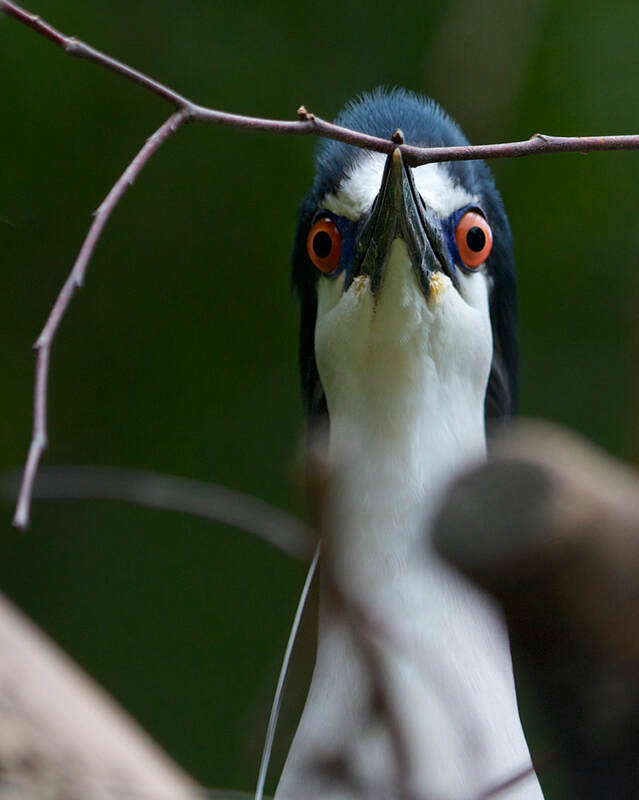 Unlike other herons, black-crowned night-herons will hunt at dusk or at night. They will stand for long periods of time waiting for a frog or a fish to pass by. They also take eggs and young from other birds, and eat small mammals, crabs, mollusks and other invertebrates. Typically they grab, rather than spear their prey. Black-crowned night-herons usually nest in colonies. The male bird courts the females with bowing, stretching, rocking, hissing and bill clapping. They build nests of sticks, twigs and reeds in shrubs or trees. The female lays 3-5 pale blue eggs, and both parents incubate for 24-26 days. Adult black-crowned night-herons apparently do not distinguish between their own young and those from other nests and will brood chicks not their own. The nearly naked young are fed by regurgitation, and then as they grow, the parents will bring them whole prey. They fledge from six to seven weeks of age. They will not acquire full plumage until they are three years old. Overall, populations are stable. Like other wetland species they will always be sensitive to water quality changes and wetlands destruction.